Astronauts aboard the International Space Station took this photograph of Florida in October 2014. The peninsula is highly recognisable even at night, especially when looking roughly north, as our map-trained brains expect. Illuminated areas give a strong sense of the size of cities. The brightest continuous patch of lights is the Miami-Fort Lauderdale metropolitan area, the largest urban area in the southeastern U.S. and home to 5.6 million people. The next largest area is the Tampa Bay region (2.8 million people) on the Gulf Coast of the peninsula. Orlando, located in the middle, has a somewhat smaller footprint (2.3 million). A nearly straight line of cities runs nearly 560 kilometers (350 miles) along the Atlantic coast from Jacksonville, Florida, to Wilmington, North Carolina. South of Orlando, the center and southern portions of the peninsula are as dark as the Atlantic Ocean, vividly illustrating the almost population-free Everglades wetland. The lights of Cocoa Beach trace the curved lines of Cape Canaveral and the Kennedy Space Center, an area well known to astronauts. 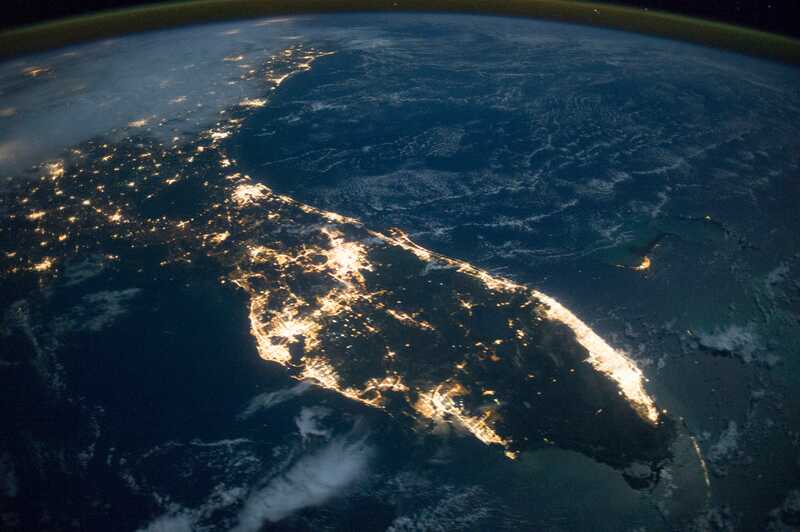 Dim lights of the Florida Keys extend the arc of the Atlantic coast to the corner of the image. The small cluster of lights far offshore is Freeport on Grand Bahama Island (image right). The faint blue areas throughout the image are clouds lit by moonlight. NASA Earth Observatory (2012, February 13) Southeastern USA at Night. Astronaut photograph ISS041-E-74232 was acquired on October 13, 2014, with a Nikon D3S digital camera using a 24 millimetre lens, and is provided by the ISS Crew Earth Observations Facility and the Earth Science and Remote Sensing Unit, Johnson Space Center. The image was taken by the Expedition 41 crew. It has been cropped and enhanced to improve contrast, and lens artifacts have been removed. The International Space Station Program supports the laboratory as part of the ISS National Lab to help astronauts take pictures of Earth that will be of the greatest value to scientists and the public, and to make those images freely available on the Internet. Additional images taken by astronauts and cosmonauts can be viewed at the NASA/JSC Gateway to Astronaut Photography of Earth. Caption by M. Justin Wilkinson, Jacobs at NASA-JSC.